“Grave” is an Italian adjective which could mean “heavy”, or “severe”; when used as a tempo indication, it directs to play at an extremely slow and solemn pace. This particular movement is the first of Handel's Sonata in E minor for flute, Op. 1, No. 1b. This work should not be confused with the other flute sonata E minor, No. 1a, which is actually a compilation of Handel's favorite movements from his sonatas. 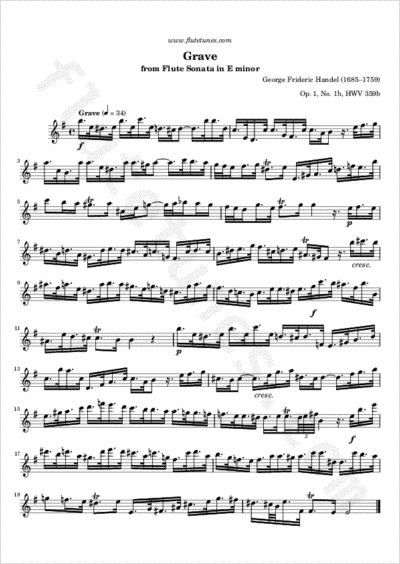 The sonata we are presenting today, instead, was originally written in D minor for the violin, and subsequently transcribed by the composer himself for the Baroque flute. The rhythm of this piece may look a bit complex at first glance; you must remember, however, that this is meant to be played very slowly. After having listened to the recording, you will see that it is not that difficult after all.